You have just returned home after a long family vacation and the video camcorder tapes are loaded with memories that you captured during the trip. The next task on your agenda is to create a short movie from all these clips — enhancing the video with captions and titles, transitions, videos effects and finally share the vacation movie with your friends and family on the web. Editing video, such that it looks interesting, is undoubtedly the hardest thing to do in the entire workflow especially if you are not a pro. In the pre-Web 2.0 era, you had to learn complex video editing software like Ulead VideoStudio, Adobe Premiere, Pinnacle Studio or the one that came bundled with your video camera in order to make simple edits but not anymore — thanks to dozens of online video editing services that make editing and sharing videos a snap. Not only are these online video editing tools free, they also involve little or no learning curve. They require no software downloads or installation and work inside any web browser. And they offer editing features that should suffice the needs of most casual videographers. 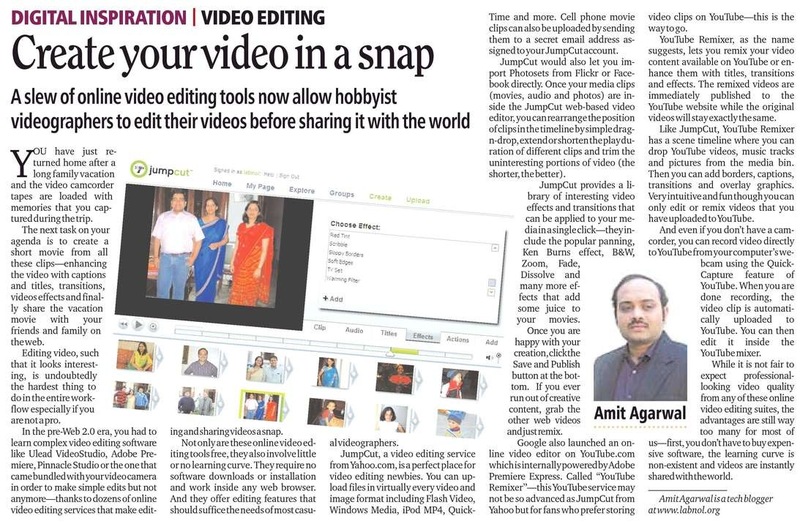 JumpCut, a video editing service from Yahoo.com, is a perfect place for video editing newbies. You can upload files in virtually every video and image format including Flash Video, Windows Media, iPod MP4, QuickTime and more. Cell phone movie clips can also be uploaded by sending them to a secret email address assigned to your JumpCut account. JumpCut would also let you import Photosets from Flickr or Facebook directly. Once your media clips (movies, audio and photos) are inside the JumpCut web-based video editor, you can rearrange the position of clips in the timeline by simple drag-n-drop, extend or shorten the play duration of different clips and trim the uninteresting portions of video (the shorter, the better). JumpCut provides a library of interesting video effects and transitions that can be applied to your media in a single click — they include the popular panning, Ken Burns effect, B&W, Zoom, Fade, Dissolve and many more effects that add some juice to your movies. Once you are happy with your creation, click the Save and Publish button at the bottom. If you ever run out of creative content, grab the other web videos and just remix. Google also launched an online video editor on YouTube.com which is internally powered by Adobe Premiere Express. Called “YouTube Remixer” — this YouTube service may not be so advanced as JumpCut from Yahoo but for fans who prefer storing video clips on YouTube — this is the way to go. YouTube Remixer, as the name suggests, lets you remix your video content available on YouTube or enhance them with titles, transitions and effects. The remixed videos are immediately published to the YouTube website while the original videos will stay exactly the same. Like JumpCut, YouTube Remixer has a scene timeline where you can drop YouTube videos, music tracks and pictures from the media bin. Then you can add borders, captions, transitions and overlay graphics. Very intuitive and fun though you can only edit or remix videos that you have uploaded to YouTube. And even if you don’t have a camcorder, you can record video directly to YouTube from your computer’s webcam using the QuickCapture feature of YouTube. When you are done recording, the video clip is automatically uploaded to YouTube. You can then edit it inside the YouTube mixer. While it is not fair to expect professional-looking video quality from any of these online video editing suites, the advantages are still way too many for most of us — first, you don’t have to buy expensive software, the learning curve is non-existent and videos are instantly shared with the world.